Throw a tea party that your little girl and her guests will remember for the rest of their lives. You can make your party whimsical and magical by defining things like theme, invitations, party favors, and entertainment. Make the event fun and memorable by customizing and selecting a theme for the party. You can request the little girls to come in their princess costumes and sequin shoes for girls and request the little boys to come in their knight attire. Talk to the other parents and hold the children’s tea party at a time suited for all. A morning tea party can be held between 10 am and 12 pm and an afternoon party can be held between 2 pm and 4 pm. You can make invitation cards based on well known tea drinkers like Mad Hatter or any other theme you want. Send them out a couple of weeks in advance for the best possible turnout. This will include items such as party favors, decoration items and snacks for the guest. Children love party favors and you could include fun items in their goody bag such as small toys and candies. 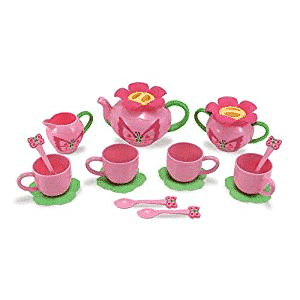 Based on the theme and the location you have your tea party you can buy childrens tea party sets, pretty tablecloth and tableware. You can place name cards on the table to make the kids feel important. You can also compile a music playlist that can play in the background during the event. For the food, you can order snacks like cupcakes, chips, sandwiches and pastries. For entertainment, the kids can make their own tea party hat with the hat kits that can be bought online or play games like passing the tea cup. Choose non-caffeinated tea in flavors like vanilla to serve during the tea party. You can serve them in pretty looking children’s tea party sets. Finally, make sure the tea is not too hot to drink for the young ones. Enjoy watching your child having fun with her guests and become the coolest parent in the neighborhood for setting up this tea party.